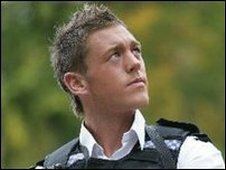 A policeman and former Mr Gay UK winner has been arrested on suspicion of carrying out a serious sexual offence. Pc Mark Carter, 27, has been suspended from his job with West Yorkshire Police while his colleagues investigate the alleged incident in Leeds. He was arrested at a city centre hotel in the early hours of Saturday morning and later released on bail. A police spokesman said: "Inquiries are ongoing and the man has since been bailed pending further inquiries."